The latest format war is hotting up, with companies starting to take sides already. Yes, we are talking about 3D and Mitsubishi has announced its latest line-up of 3D-ready TVs. The only catch is that they are ready for 3D content, only if it comes from "checkerboard display formats". This does mean that the company is taking a bit of a gamble, considering how we are going to eventually get 3D in the homes isn't exactly set in stone. Nevertheless, the line-up is impressive. The 737 series offers 1080p picture quality on a rather large screen. 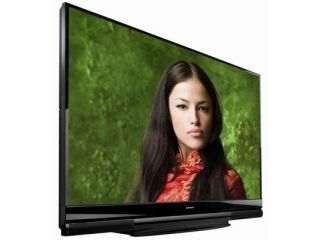 You can choose sizes between 60 inch, 65 inch, 75 inch and 82 inch. Each set offers a 120Hz refresh rate. The 837 series is available in the same sizes, except there will be no 60-inch version. David Naranjo, director of product development for Mitsubishi, said about the sets: "As the home theatre market continues to flourish and the cinema space continues to embrace 3D, we clearly see MDEA's 3D-Ready Home Theatre TVs playing a key role in meeting consumers craving for the best and most advanced home theatre experience." The may not be much 3D content around to view on the tellies but we can't help but get excited about an 82-inch LCD TV that's ready for home use. Pricing for the TVs starts at $1500 (£1020), all the way up to $5000 (£3408).